Originally rejected by DC as an addition to the universe of The Legion of Super-Heroes, the happy go lucky Nightcrawler has bamfed from X-Man to leader of Excalibur to the main reason readers want to learn German and back again, for generations. 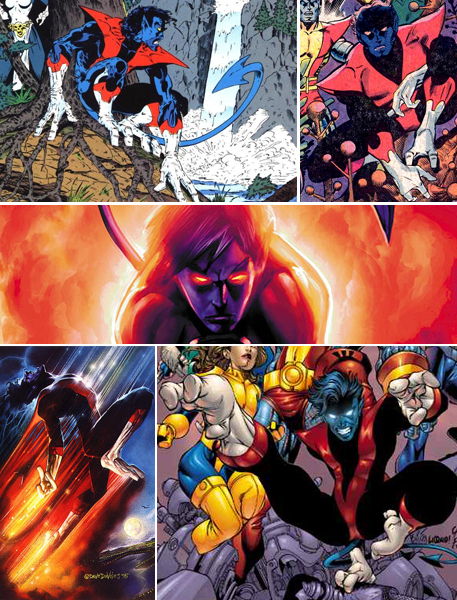 The hippest of those hated mutants, I thought now would be a good time, as we wait for Kurt's return (over the Age of Apocalypse Nightcrawler currently summersaulting through the pages of Uncanny X-Force) to track the Top 6 Nightcrawler Artists Ever (up until now). 6) Matthew Ryan I instantly loved this pin-up teasing the connection between Mystique, Kurt and Rouge. I'm not sure if it's the pose or the exaggeration of Kurt's hands and feet, but it just works. 5) Dave Cockrum Creators should always make the list. No one beats Dave on Nightcrawler's face, and as a nod to Dave's talents, only one on this list features a costume other than his original unbeaten design. 4) Jeremy Roberts Playing to Nightcrawler's demonic elements can be a tightrope, as it takes you away from the jovial nature of the character. Here Jeremy walks the line just fine. 3) Dave DeVries A Marvel Masterpieces card worthy of the name, Dave dives into the more demonised aspect, yet pulls off a 'bamf!' like few have yet managed to match. 2) Carlos Pacheco Without a doubt, my deffinitive Nightcrawler image. While he finishes at number two, if Kurt should ever get his own series, Carlos should be the only man to draw it. 1) Alan Davis While no book has matched his artistic tone as much as Excalibur did, no character has suited Alan's legendary style as much as Nightcrawler. While I said Carlos would be the best artist for any future Kurt based series, if Marvel wanted to do a Chris Claremont and Alan Davis Excalibur Forever series, I wouldn't complain either. What do you think? Who is your #1 Nightcrawler artist? Alan Davis ...NO DOUBT!!! Best Elf ever! 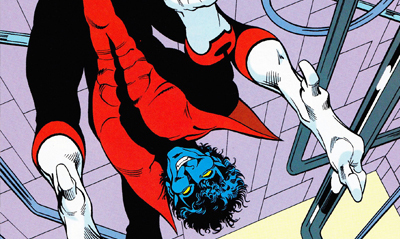 I totally agree, Alan Davis captured the essence of Nightcrawler like no other. He is also the only one who can do real justice to Captain Britain and Meggan! I totally agree with your totally agreement ElvenBrit, Davis draws those three like no other. Despite how many years role on, those early issues of Excalibur still hold up today. It really was one of those 'perfect all round creators/creations combinations. Marcelo seems we have a unanimous decision going on here huh? Thanks for the comments folks!! I'll show this post to the Mrs.
Kurt's one of her all-time favorite characters. I tell ya Craig, you married a lady of great taste! 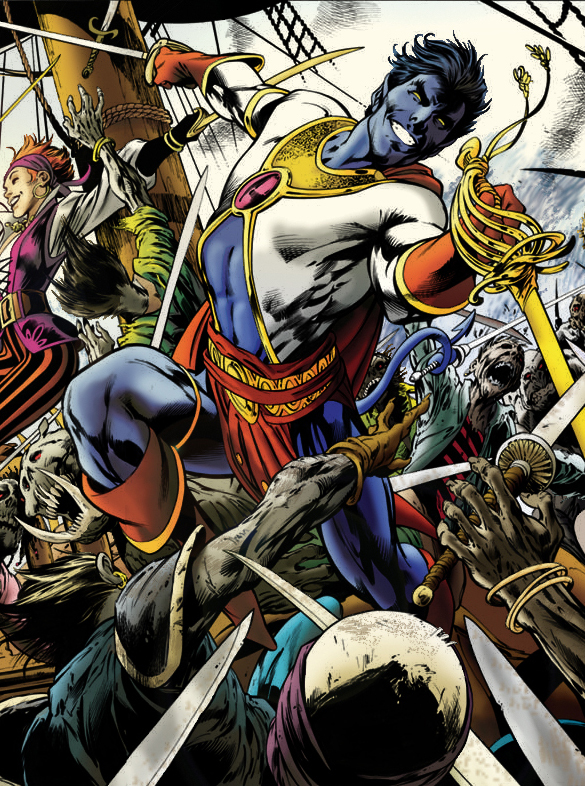 Nightcrawler's the awesomest guy going (except when Archangel's in the room that is)! I also like Mike Choi's version of Nightcrawler. Thanks Gabriel - Mike's is another great choice!